On the southern Caribbean coast of Panama sits an array of beautiful islands, with colourful villages and dirt roads that you can explore on a scooter. White sand, turquoise Caribbean waters, palms overhanging the water. Yeah, these beaches deliver some of the most idyllic beaches you can imagine. On this particular day we had been exploring Isla Colon (Colon island) all day long with a couple of scooters we hired from Bocas del Toro. In the evening we ended up far up the northern end of the island, at starfish beach. It’s found it’s name from the large amount of starfish found in the immediate area. The banks were saturated with picture perfect palms, all over hanging the water, with the mainland’s peninsula skimming the horizon. As the sun headed towards the horizon, a lovely warm glow filled the sky. 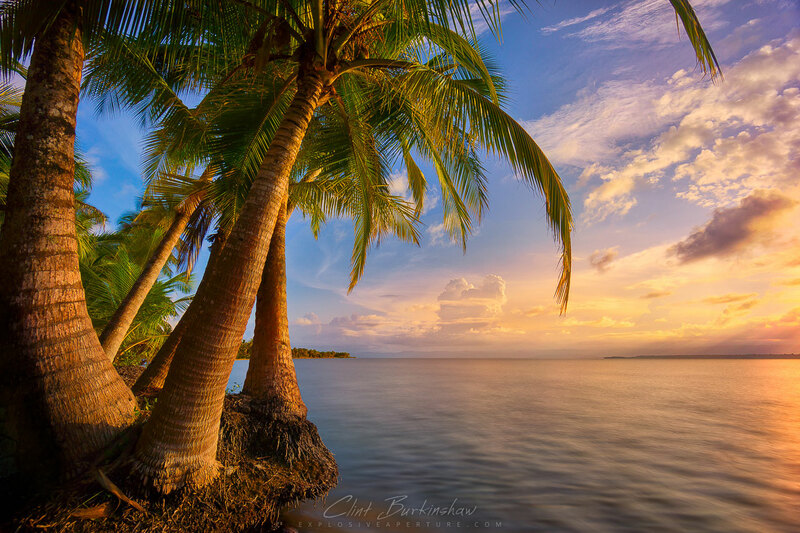 I took this photography by moving out into the water, kneeling down lower and shooting upwards in order to put the horizon on the lower third, allowing me to capture the overhanging palms. The colours in the pic just pop, and every time I look at it, I want to go back!